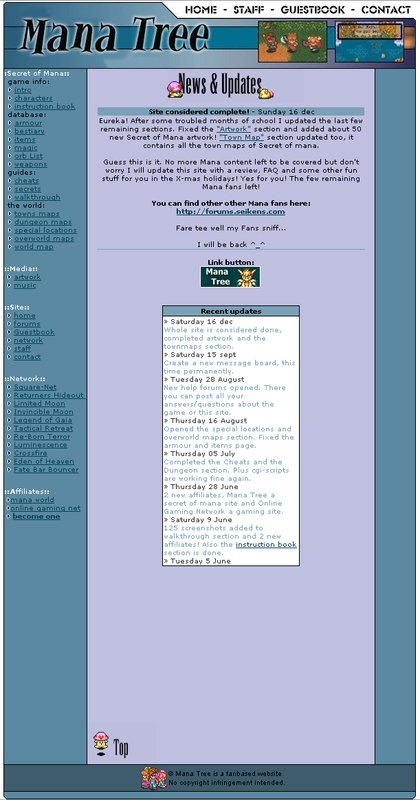 Back in 2001, two sites came together to form the Seikens Network, joining them together with one common launch page and one set of forums, but two individual personalities for the main sites. The first of these sites was Mana Tree, run by Ragnarok, covering information surrounding Secret of Mana. on the 16th of December, the site was declared as complete and would not receive further updates, but forums would continue to run. Mana World was the sister site to become part of the Seikens Network, run by Deques and covering everything to do with Seiken Densetsu 3, as well as latest news for Square’s game series. In April 2002 the time came to bring the two sites together as one unified page, becoming The Seikens, a site that would cover Secret of Mana, Seiken Densetsu 3, and the rest of the Seiken Densetsu series. A new site joined the network, SolarLoM, covering Legend of Mana, and news started coming in for a new upcoming title for the Gameboy Advance, Shinyaku Seiken Densetsu, Sword of Mana. 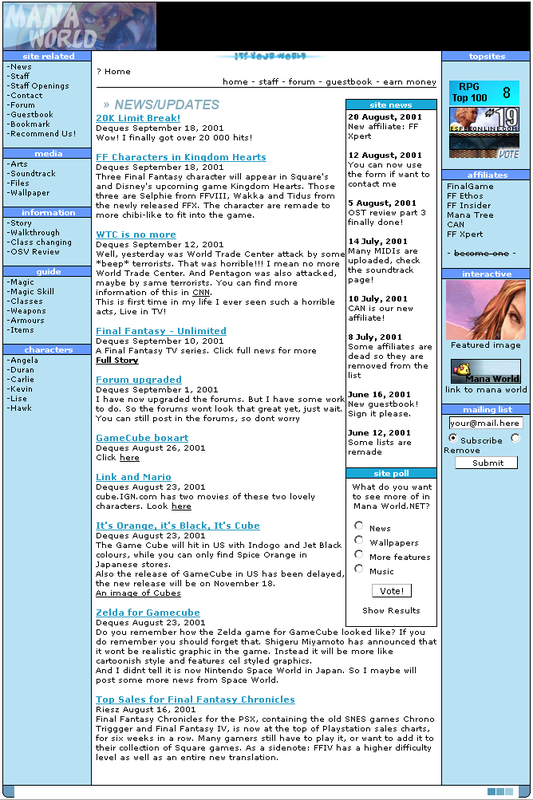 This first layout of the page would last until March 2004, when the site would be revamped to version 2, the green layout, and hosting a sub-site for Sheexy and his fan games based on the series. Later that year Ragnarok, due to other obligations, would leave the site in Deques’ hands, and Sheexy would become co-webmaster for the main site. In 2005, Square registered World of Mana, and news started coming in surrounding the revival of the series. In 2006, as the World of Mana series began to advance, Kassidy would become part of the news crew for Seikens, and later form part of the webmaster team to further advance site content. 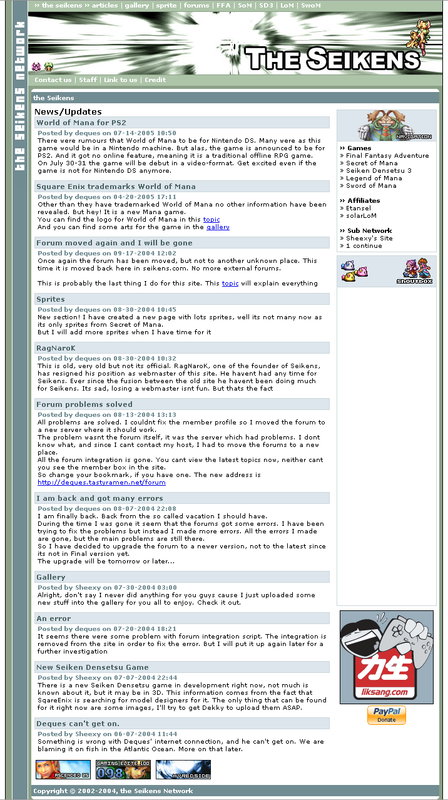 March 2006 saw Seikens revamp layout again, leading to the site you see before you today. Today the team continues to bring updates to information covering all games in the series, latest news, and multimedia surrounding Seiken Densetsu. Who Am I. Thats my name: Wai. I am one of the two original webmasters of Seikens. Me and RagNaroK started this site as network site at the beginning. I made Mana World that covered Seiken Densetsu 3. With RagNaroK’s Mana Tree, that was about Secret of Mana, we created the Seikens Network. Today I have been working lots different stuff, like installing new stuff for Seikens ie. the new gallery and WordPress. I also made all the layouts for Seikens. Currently this is layout number 3. In my free time, which I don’t have much, I like to play video games. I am much into RPG games, but due to lack of these kind of games in Europe I also play some random action games for PS2. When I don’t play games, I like to make site designs. Recently I have earned money for my efforts, which I really like. You probably wonder why name isn’t “western”-like. That’s because I am not westerner, I am asian. Probably the only asian of all webmasters of Seikens. To be more exactly I am chinese. My parents moved to Sweden a few months before my birth. So I have lived in Sweden pretty much all of my life. My first experience with the Seiken Densetsu series was when my mother rented Secret of Mana from a rent store. Me and my brother got very much into this game. It wasn’t like any game we ever played then. So we tried to rent this game as much as we could. But our mother didn’t allow us to do so. So in the end we finally got our own Secret of Mana. I have no idea why we sold it when we sold our SNES. I regret that very much. Later we saw Seiken Densetsu 3 in a swedish gaming magazine. It looked like SoM, but we werent sure. This game became one of my favourites when I got this in an emulator. But by then it wasn’t translated yet. So I used a walkthrough to play through the game halfways or something. When the translation finally came I was able to play this game. And it became my number one SD game. It had and still has everything. Favorite Mana enemy: Ninjas, Shadow Zero, Rabites! I’m pretty much a normal guy with way too much time to commit to the Seiken Densetsu series I guess. I go to a university and it is probably pretty fun, it involves walking more than learning which is kind of weird. I’ve got long hair because I’ve grown too used to it and because I am too lazy to go get it cut. I used to be really lazy like Deques, but I got over it. Still procrastinate though. Every Friday I don the probably magical “Friday Suit” which is actually just a ripped up, beat up, bleached up, old shirt that I have worn every Friday for like seven years. The Friday Suit is something of a legend. Secret of Mana was my first experience with the Seiken Densetsu series back when I was six. I was hooked on the game the first time I played it. I even made my friends play a pretend Secret of Mana out in the school yard during recess. Oh the adventures Randi, Popoi and Watts had. We had to use Watts because none of my friends wanted to be a girl. After that I found Final Fantasy Adventure and its deep storyline for such a limited game really amazed me. Currently I think the entire series is going downhill and it is really sad, but I’ll stick through it, it’s going to get better! Personally I blame Willy not dying in Sword of Mana for the problems the series is having. My history with Seikens started when I became friends with RagNaroK. He and Deques ended up making Seikens, and I got my own little page there with some Seiken Densetsu fan games. A few years later, and blammo, all the sudden I am a webmaster because Dekky got lazy and someone needed to pay for the site. Cut to three years later, I finally finished something for the site, haha. Now I’m up to updating the thing almost non stop! So that’s me. Sheexy. You read about me. Alrighty then. Most used words: Cuppa Tea, smeg, ook, various permutations of grunt. There was a general concensus round the beginning of the thirteenth century that there were far too many sane people in this world, and it was as a consequence that he came into existance. Not quite in the impresive cinematographic way that requires a very large budget in special effects, but more in the manner of a simple blip on the universal radar of existance, waiting to be homed in on. Born in a hospital bed somewhere round three in the afternoon, KMK is a 6’2″ skinny brit that only brandishes black clothes, generally wears sunglasses due to his hypersensitivity to light, has long black hair and debatable eyes (though it has been confirmed that at least there are two), and at the moment of writing this, he has the kind of beard that can only be described as “in dire requirement of maintenance”. He is often accused of being eccentric and incoherent, and prone to talking backwards and in third person (as is evident by your current reading material). It’s suspected that his addiction to cheese may have something to do with this. I was introduced to Secret of Mana by a friend in Spain, and was immediately hooked. A group of us kept borrowing it off him time and time again. I later found a second-hand copy in England and bought it on a trip over there (this was before the days of the internet being wide-spread). After that I constantly researched SD3 with the hope it would be released, and remained an avid fan of the series since. I came across Seikens in one of its previous incarnations while researching for a fan fiction I was working on called “Return of Mana”, and lurked for some time before participating on the board. When I started contributing more was with the news coverage of the World of Mana revival, in particular Children of Mana, which lead to me joining the news team for the site, and more recently the webmaster team, allowing me to directly contribute material wherever I can to the site. And all of this pales to utter insignificance in light of the fact that my teacup is once again empty. Savvy? Favorite Mana what-ever: Never played them. So i’ll make my own list. Favorite game: Final Fantasy IX (Square related). Favorite tv-serie: The Big Bang Theory. Favorite music: Radiohead, mostly rock (not j-rock). Favorite locale: Sleeping in my bed! Most used words: the “…” and emoticons. Hobbies: Programming, Animation, getting involved in to many projects. Site Credits: Scripting and making the next gen of Seikens. How I got involved with Seikens the first time was during my university time. I was in the same class as Deques. Eventually both of us became friends and he showed me Seikens.com, at first I show zero interest as I never even played the mana games (and still haven’t). But I was still Lurking around and joined the board (the old one) but never posted. Then when the new version came I didn’t even join the board this time. Now deques began to see how good of a programmer I was (I guess) and I was givin him a lot of ideas, he even asked for my shoutbox script to incorporate to Seikens. This is when I rejoined the forum, now I even became friend with Sheexy and it sort of grew from there. So now a small history about my alias Ailise, I have many times been confused for a girl because of the name and I don’t blame anyone. It is a girls name that I created during my long long time playing Ragnarok Online, I used to play a female character because it was more fun and my main character was named Ailise, which also became the name everyone called me in the end. After the RO time I was so used to the name and many still called me that, it sort of became my alias everywhere. I guess that’s all I had to say. Who helped out on the site? Seikens has had tons of help over the years, here we’ll give out a thanks to those who have kept us moving. Also known as Raggy, this dude is another one of the founders of Seikens. He created the Secret of Mana section. These people have served as guardians of the forum. Today it is Faal and Kyatto who continue to slave for us. I don’t know this guy, but he did one insane job on his solarLoM page which he kindly let us add to the network. We probably owe half of the credit for the images in the gallery to this guy. Contributed the Dawn of Mana Game Review. He has eaten many of the people on the forum too. This guy hosts Seikens, and that is just awesome. Koopa has helped us do some cool coding stuff! He helped Deques add fancy URLs to the site and helped Sheexy with the Bestiary navigation. 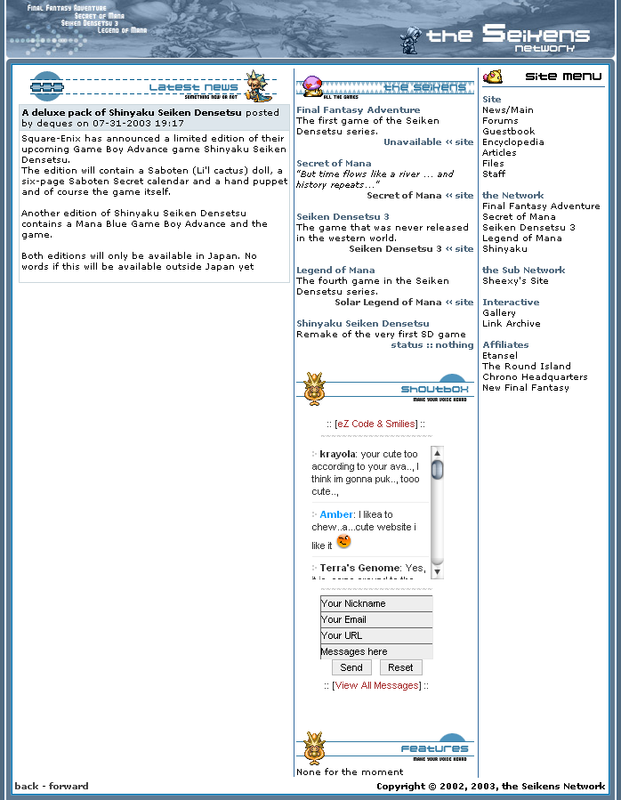 LegaiaRules contributed the Dawn of Mana Level Guide, Boss Strategies and Game Tips. Nick is currently contributing content for the Dawn of Mana section, such as the Emblem List. The Webmaster from this site is the source of most of the older Seiken Densetsu scans that exist on the web. Nathanyel contributed to the correction and addition of name origins for Raffi, Harzinger and Claude in the German version of Secret of Mana.